Layering pieces are some of the most important items in any wardrobe. Sweaters, cardigans, shawls, and wraps have a host of uses that make them essential for everyday life. Light summer wraps that transition between hot outdoor weather and cooler indoor temperatures are just as important as winter layering pieces, but they tend to be a little lighter and easier to wear. If you thought cardigans were just for fall and winter, you are missing out on a whole new world of comfort and flexibility. We love summer wraps so much that we created our Inge wrap to be the perfect lightweight layering piece, and we’ve been making it for over six years! 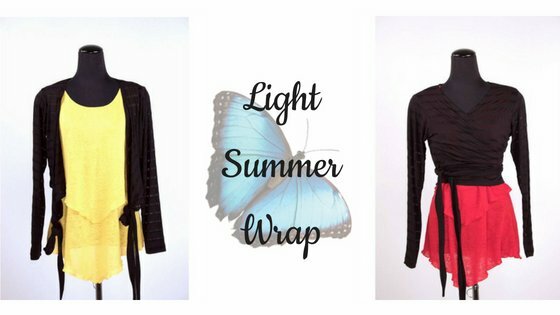 Here are a few of the reasons we love light summer wraps. We love texture and pattern mixing in outfits, but it can be tricky to layer pieces when the weather is hot. Lightweight wraps give an outfit some dimension and character without adding a lot of heat. Thin, organic materials (we love cotton!) layer beautifully and won’t send you running for an air conditioner. Summer styles allow for more flexibility, since you don’t have to make sure every inch of your torso is covered in warm fabric. You can opt for a fun wrap style, a tie-waist look, or even just a pashmina wrapped around your shoulders in an infinite variety of styles. There are a huge range of styles to choose from! Thin, easygoing summer wraps can be easily folded into suitcases, backpacks, and purses. They’re the perfect travel companions for alternating between ice-cold airplanes and overheated airports. Wrinkle-resistant fabrics are even better for travel days. Speaking of temperature swings, wraps help bridge the gap between air-conditioned rooms that are too cold for just a summer dress and baking hot external temperatures. Just because it’s summer doesn’t mean that you don’t get cold! Summer wraps are also perfect for that in-between seasons time when you’re not quite in fall but not quite in summer. Wraps are an elegant addition to most outfits. Their classic silhouette and shoulder-covering style can dress up a summer dress that’s too casual for a nice dinner without giving it that fussy, out-of-season look. But on the other hand, you won’t look out of place wearing one to a casual event with friends, either! They strike a great balance. Office environments can have big shifts in temperature that can be difficult to dress for. Summer wraps keep the chill of an over-powered air conditioner at bay, make sleeveless blouses more work-appropriate, and stow easily on the back of a chair for ease of use. Some people like to have an “office cardigan” that stays on their chair. We made our Inge wrap in classic, timeless black to give it maximum versatility. Other neutrals like cream, navy, and white will look great with the most possible outfits to give you the most flexibility. Stop by our store to see a great selection of summer wraps!